As our server cleared away our plates of half-eaten food, my mother whispered to The Astronomer and me, “Bottega Louie is only a little better than Bucca di Beppo.” Agreeing with my mother’s sentiments, The Astronomer suggested that we should have gone to Maggiano’s for dinner instead. When the memories of a meal evoke comparisons to chain restaurants, I can’t help but weep a little inside. It started out well enough. Bottega Louie was chosen as the site of our monthly dinner date because my vegetarian mother was in the mood for Italian, and downtown Los Angeles was midway between our respective locations. Since its opening this past April, positive reviews have been rolling in on a regular basis on both the blogger and mainstream media fronts. Even though I received a few stern words (you know who you are) warning me against dining here, I decided to take my chances. Our party of three was seated in the main dining room with a great view of downtown’s gritty streets. All one needs to know about the interior is that it is as loud as it is pretty. After placing our orders, we were served crusty slices of bread wrapped in wax paper with softened butter. For my main, I chose the clam pizza with mozzarella, pecorino Romano, roasted peppers, thyme, extra virgin olive oil, and garlic ($15). Sliced into eight generous pieces, the pizza was portioned for two hearty eaters. I was more or less satisfied with the various components of my pie save for the main attraction—the clams. The bits of chewy meat dotting my pizza hardly resembled clams due to their grossly mutilated state. Flavor-wise, the clams boasted essence of tin can rather than essence of the sea. My mother’s penne pomodoro ($9) with tomato sauce, garlic, and extra virgin olive oil was served with grated Parmesan cheese on the side. 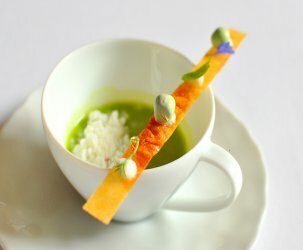 With a dish this simple, it is of utmost importance that each and every ingredient is impeccable. 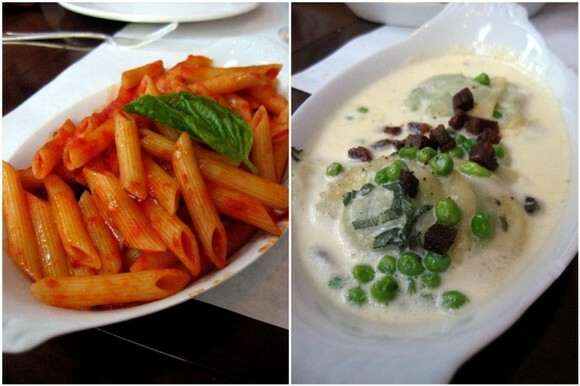 Even with a heavy sprinkling of salty cheese, the penne tasted upsettingly bland. The Astronomer’s house-made ravioli stuffed with spinach and ricotta ($12) was the sole winner among our mediocre main dishes. The light cream sauce with pancetta, sage, and peas was good enough to sip with a spoon once the pasta had disappeared. In addition to our mains, we also shared three sides. 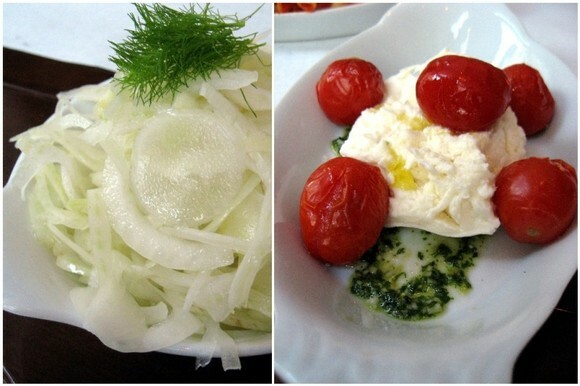 The shaved fennel and sweet onions ($6) were dressed in vinegar and topped with sprigs of dill. The thin slices of fennel were pleasant enough, but the raw and astringent onions stubbornly lingered on our tongues long after swallowing. The burrata with pesto, olive oil, sea salt, and grape tomatoes ($8) was thankfully very delicious. The stringy cloud of light and flavorful burrata was greatly enhanced by its well-chosen accouterments. 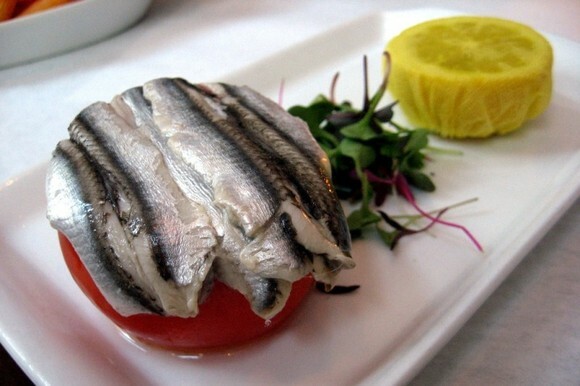 The white anchovies ($7) arrived resting on a tomato with micro greens and half a lemon served on the side. The anchovies were terrific, but I would’ve gotten a bigger kick out of a more complicated preparation. For the sweets portion of our meal, The Astronomer chose the semifreddo with Brandy macerated fruit, chocolate, and caramelized almonds ($7). The semifreddo was lovely in its half-frozen state, especially the bites that contained plump golden raisins. 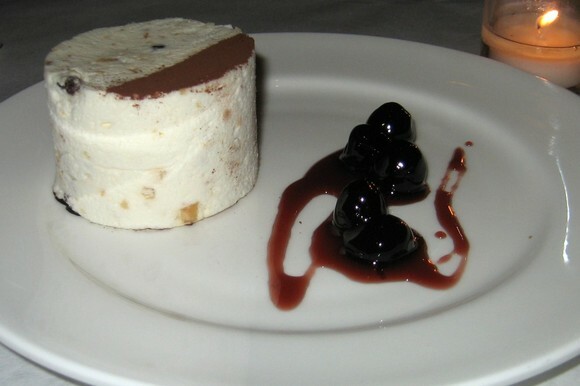 The candied cherries strewn on the side were too tooth-achingly sweet to balance the semifreddo properly. The famed Bottega Louie peanut butter terrine ($7) lived up to its hype. 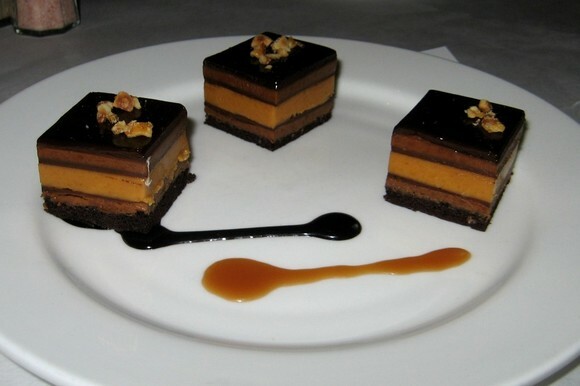 The alternating layers of peanut butter and dark chocolate ganache were rich, decadent, and guilt-inducing. 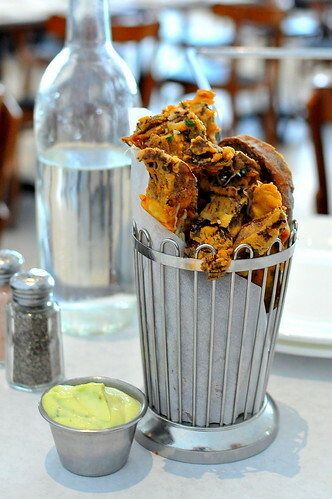 Portobello fries ($10). Tasty enough, but about $5 too expensive. 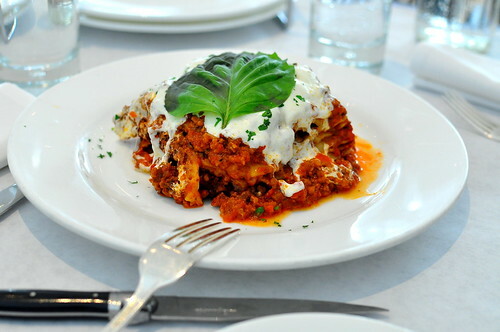 Lasagna ($16) with a traditional Bolognese meat ragù, béchamel, buffalo mozzarella, ricotta, and Grana Parmesan. My dining companion found it very tasty. I found it about $5 too expensive. 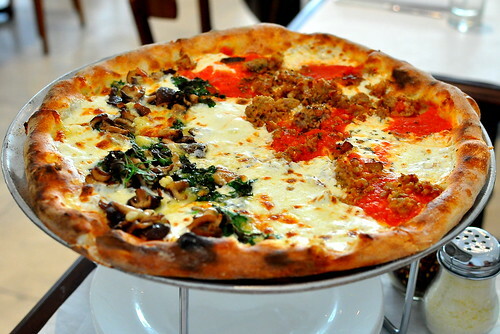 Half Sausage (mozzarella, Grana parmesan, tomato sauce, oregano, fennel sausage) and half mushroom pizza (Fontina cheese, fresh mozzarella, crème fraîche, shiitake mushrooms, garlic, Italian parsley) ($18). Very tasty, but about $5 too expensive. 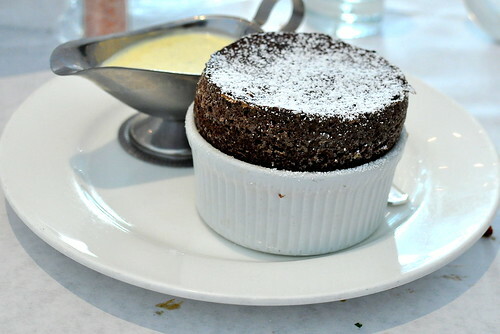 Chocolate souffle ($15). You guessed it, tasty, but about $5 too expensive. the emperor has no clothes. i’ve been twice. the first time was decent (lunch fare, small plates), the second time – the inattentive service and lack of any menu items worth raving about, left me wanting more. i do think the larder is a good extension and serves as a good option for lunch on the go (e.g., saucisson sec on baguettes). overall, the space is pretty – but that’s about it. I’m so glad I didn’t take my mom here when she came up for the day. I was really close to going for lunch, but was strongly encouraged to reconsider. Such a bummer — it seems like it should be such a great place! I think I’m going to stick to the fave – P Mozza. They would never serve me a mutilated clam from a can! 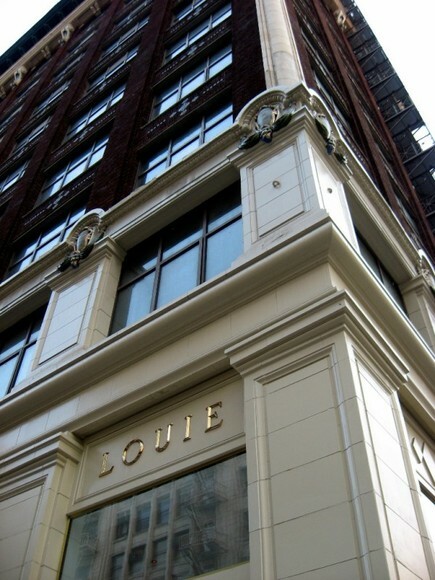 I guess I’ve been lucky in almost everything I ordered at B-Louie — I’ve read both positive and negative reviews (mine was one of the former) but all the bad reviews involved items that I’ve yet to try. Guess it’s one of those restaurants with a menu landmine where stuff are hit or miss. I’m having second thoughts about trying this place, despite the pros I’ve heard…. Bucca? Yuck…. That looks a *little* better than Bucca (but I should qualify my view by saying that I ate at Bucca with someone very, very difficult). At least some of the things you ate were quite good. Your photo of the anchovies is lovely – makes me want to eat them. That’s too bad. I just had a really great brunch at Bottega Louie, my first time there. The salmon eggs benedict and Belgian waffle were pretty much perfect. The service was a little awkward, but other than that, my friend and I had a lovely early afternoon there. Your mom’s pasta dish looks like when my boyfriend makes pasta on a Thursday night and he’s too tired to try very hard. Trader Joe’s sauce on dried penne. It fills your belly, but you’re not terribly happy about it. Oh, so sad! I’m with H.C. I’ve had good experiences. I lurve Bottega Louie. Bummers. 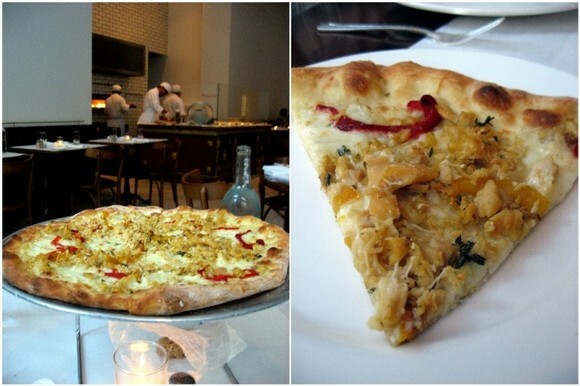 I loved my clam pizza. He’s my downtown friend. But BL is more about atmosphere than food. Maggianos like? oouchiess!! Sookie – Truth be told, these two Gastro Astro kids love Maggiano’s. A LOT. I love reading about your culinary adventures (especially when you and the astronomer were in Vietnam. Oh how I wish Little Saigon was little closer to New England. Thanks for the stories and keep up the good work! P.S. 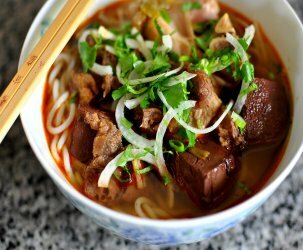 one of these day, I will get around to posting some Vietnamese recipes of my own, but thanks for sharing yours! I tried your shrimp toast recipe and it was delicious! Been wanting to try this place out. The pasta line chef in our company cafeteria works at Bottega Louie and always tells me to come check it out. I’ll have to see what HC ordered. I love reading about your food adventures. 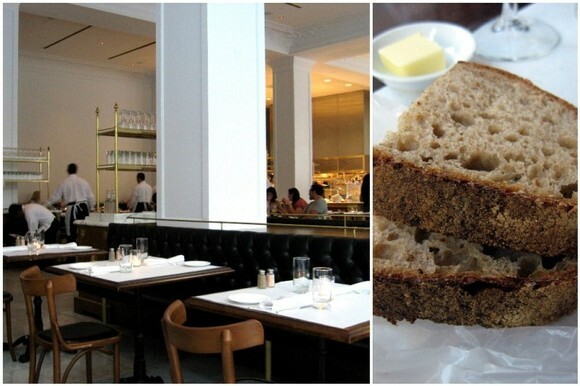 Being a DTLA resident I have been to Bottega Louie a handful of times and must say I love it. I cannot fathom the bucca or maggiano comp. The food is always fresh, light and lovely. Their brunch is paricularly wonderful. The pastries have significantly improved, I think their croissants are the best in LA on par with Balthazar bakery in NYC. The space is LOUD. I just got back from lunch here and it was fabulous! Maybe it’s improved since your last visit? My co-workers and I shared a margarita pizza, lasagna, and the portobello fries, all of which were yummy. The lasagna especially was delicious–we were practically wiping up the last bits of sauce with our fingers–it was quite a site to behold. And it doesn’t hurt it’s only three blocks from our office 🙂 Any time you want to try it again, you just let me know! Bottega Louie is incredible. 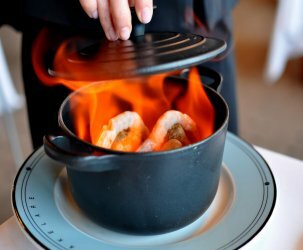 I think this review is a bit old as I just went there and not only was the food great but the service made it wonderful. I got the lasagna and my partner got the hamburger and we were both very impressed. We also split a pizza and it felt very authentic to a NYC style pizza and is definitely big enough to share.